I am sure that it will know that I am a huge fan of all things MAC. I feel like MAC a couple of years ago was the product to try out and it seems to be fading out a little recently and we are moving more into the realms of Nars and Too Faced, but MAC has some incredible products that I cannot tear myself away from and one of them is the MAC Select Sheer Pressed Powder. 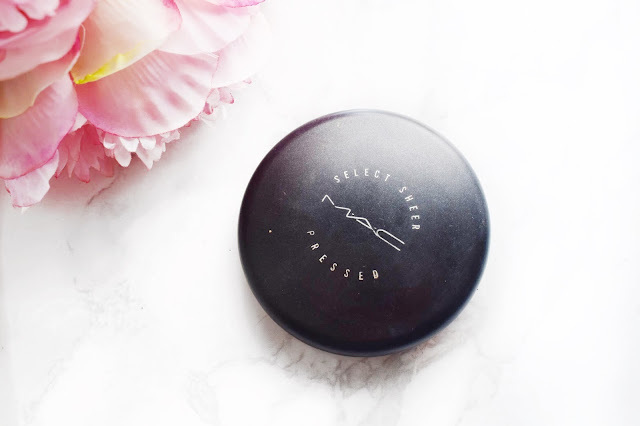 This was one of the first products that I ever tried from MAC and I am pretty sure that it is the one that I have repurchased the most over the years, and that is why I wanted to upload this post for you guys. Every single day when I get up in a morning and do my makeup, I set it with powder. I usually use a translucent powder because I feel like it really locks in my makeup for the whole day while I am out of the house. Even though I do set my whole face, I have to carry some form of pressed powder with me throughout the day because I have an oily complexion. This means that throughout the day, as I get warmer and just as my skin starts to produce its natural oils, I have to go in and blot to help control the shine and this MAC powder is my compact powder of choice at the moment. I first bought this powder when I was just on a little MAC binge and I decided to pick it up and try it out. Little did I know at the time that this would quickly become one of my favourite and most used products. I even have 3 of these at the moment so that I can always have one close to me. I have one at my desk at work, my vanity at home and another in my handbag for when I am out and about. I think that fact that I have three of these on the go at the same times just really shows that I am loving it and it is my favourite powder at the moment. As I do start to get a little shiny and oily throughout the day, I pull this powder out with my Real Techniques Setting brush and just blot a small amount over my face. What I love about this powder is that it instantly hides all of the shine, but it doesn’t look heavy on the skin. From the moment that this is put on the skin, you cannot even see that any additional product has been used because it is lovely and lightweight. Before this I used the Chanel Vitalumier Pressed Powder, but I reach for this one hell of a lot more than I ever thought that I would. When I bought this MAC Sheer Select Pressed Powder I got the shade NC40, which is similar to my natural skin colour because in MAC I buy NC44 in the MAC Studio Fix Fluid Foundation. I was a little worried that using a colour that is close to my natural skin tone would make my skin look dull in the areas where I apply concealer as a highlight, but because this is such a lightweight and sheer powder, the colour barely comes across. I would even be as bold as to say that this powder is near on translucent, which is perfect for me after I have used cream highlighter and contour. One thing about this powder which is a pretty big negative is that the powder does shatter quite easily in the pan when you are running low. As the product gets thin in the pan and if it is put down any harder than incredibly gently, I have found that it does smash. For me, when I notice that I am running low on the product, I switch out my powders and make sure that the thin one is at my vanity at home rather than in my handbag. I have had a powder explosion in my handbag more than one time and I am not a fan. Other than that, I think this is an incredible powder. I even recommend that the brides that I work on, go out and buy this powder because it just helps to lock in your makeup and keep it looking fresh all day long. Having a reliable powder in your collection is an absolute must have because even if you don’t need to reach for this every single day, there will always be a time when you take glimpse in the mirror and look a little too shiny! I will leave a link to this powder down below in case you want to check it out for yourself. Make sure to leave me a comment down below and let me know if you have tried this out and what you think if you have already used it!